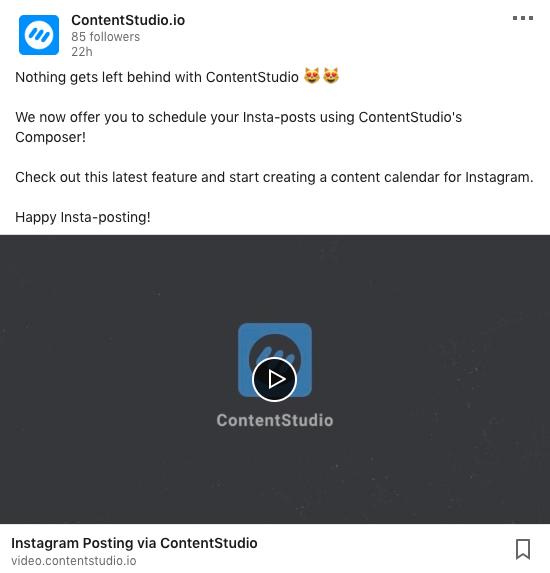 In this article, you'll learn about the essentials of uploading and sharing videos to your social channels via ContentStudio. Below are the sections of this article. 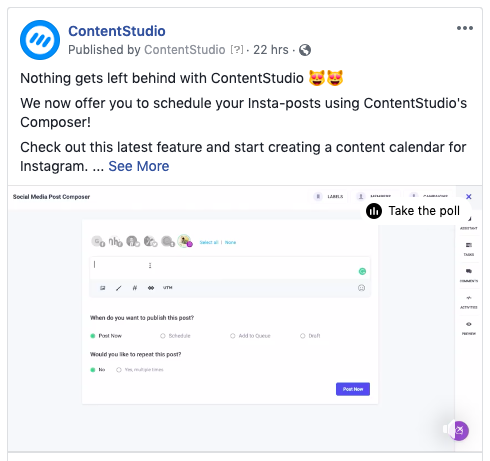 In this article, you'll learn to compose social posts including native videos and share them to your social accounts through ContentStudio's Composer. This article will guide you to share videos on the following social channels and how the videos will appear on each social media platform. But first, view the video upload requirements that should be kept in mind before sharing a video to the above mentioned social networks. Note: If you upload a video file larger than 1GB then your video will be enabled via compressing it to the supported size. Nonetheless, the compression will be minimal and so will be the quality loss. These videos can then easily be shared to the social channels. If the video is 0-5 minutes long, 1 thumbnail per 15 seconds is generated. If the length of the video lies between 5-20 minutes, 1 thumbnail per 30 seconds is generated. If the video is longer than 20 minutes,1 thumbnail per 45 seconds is generated. If the video is longer than 1 hour, 1 thumbnail per 60 seconds is generated. By default, the video's name when it is uploaded appears as the title of the video. If you want to edit it, click on the pencil icon and edit the title and save the changes. The videos posts you create for each channel would look differently on each platform you select. Similarly, the custom titles and thumbnails you choose will be used if the platform allows to consider them. Let's review the behavior of the video platform wise. Facebook Videos are uploaded natively and played automatically with the custom title as the name of the video. Due to the redundancy of thumbnails, custom thumbnails are not considered for the video preview. The videos you publish on Facebook are uploaded natively and they are played automatically. Unfortunately, the custom thumbnail you choose while publishing the video is ignored because the thumbnails for Facebook are redundant which is why Facebook chooses a random thumbnail for your video. However, the title of the video becomes the name of the video on your page/ group and anyone can view your video library and search for that video using this name. You can always change this title even after publishing the video. This is how your video will appear on Facebook. For now, we don't support publishing native videos on LinkedIn. Therefore, all the videos published will appear as ContentStudio's video library link. Whenever someone will click on the link, they will be redirected to our video library and they can watch the complete video here. The video will be previewed by the thumbnail you selected while publishing the video. As for the video title, it will appear beneath the video along with the video link. As per Twitter's policy, you can only upload videos that are 140 seconds long and of the size 512 MB. Videos published via ContentStudio are published natively on Twitter. Your custom title and thumbnail are chosen when the respective video is shared on Twitter. MP4 videos that don't have audio cannot be shared to Twitter. If a video shared via ContentStudio on Twitter is longer than the maximum allowed threshold i.e. 140 seconds, it appears as the ContentStudio's player link. If the viewer wants to view the video, they'd have to click on the link and they would then be redirected to ContentStudio's video library. Videos shared on Pinterest via ContentStudio don't appear as native videos rather they appear as a video link to ContentStudio's video library. This link will be added to the description of the pin. The thumbnail you select while sharing the video becomes the preview image of the video which shows the video link upon hovering over it. Upon clicking on the video link, the user will be redirected to ContentStudio's video library where they can view the complete video. The title you select becomes the title of the video in the Pinterest post. Here's how your video will appear on Pinterest.